Leafmould is formed from decaying leaves and produces an invaluable soil conditioner. The best quality leafmould is produced from the leaves of oak, beech or hornbeam. Leafmould. Credit:Tim Sandall/RHS The Garden. All leaves and conifer needles will eventually break down into leafmould. Some leaves, such as oak, beech or hornbeam, break down with little assistance and produce an excellent quality product. Thick leaves like sycamore, walnut, horse chestnut and sweet chestnut need to be shredded before adding to the leafmould pile, as they are much slower to break down. Alternatively, they can be added to the compost heap after shredding. Evergreens such as holly, Aucuba and cherry laurel, are better shredded and added to the compost heap, where they will break down faster than if added to the leafmould pile. Pine needles are worth gathering and placing in a separate leafmould pile as they produce acidic leafmould, which is ideal for mulching ericaceous plants, such as rhododendrons, azaleas, camellias, Pieris and blueberries. Collect leaves from your own garden or public places. Those collected by main roads may be affected by atmospheric pollution, so leaves from quieter streets and side roads are preferable. Leaves are easier to collect when the weather is dry and still. If it is windy, rake in the direction that the wind is blowing and gather the leaves up with leaf boards or a lawn vacuum. Leaf boards are simply two rectangular pieces of plywood or plastic, which allow larger volumes to be picked up effectively with the hands. Collect leaves from the lawn using a rotary mower, as this not only shreds the leaves and hastens rotting but also adds grass clippings, so increasing the nutrient value of the leafmould. Place the leaves into a bin liner, moisten them if they are dry, then pierce holes in the bag with a knife or garden fork, tie the top loosely and stack the bags out of sight for up to two years. Alternatively, make a square or round frame from chicken wire or similar, supported at the corners or at intervals around the circle with stakes or bamboo canes. Ideally this should be in a sheltered part of the garden to ensure that the leaves are not blown away. Make your leaf heap as large as possible to hasten decay, and moisten it periodically if it becomes dry. Most leaves take about two years to break down. Poor quality leafmould, or leafmould that is less than two years old can be used as mulch, soil improver, autumn top-dressing for lawns, or winter covering for bare soil. 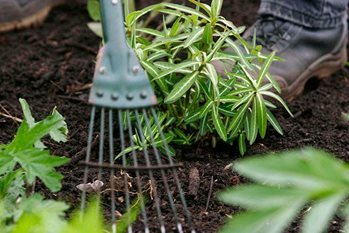 Leafmould heaps can become infested with weeds, so use the resulting product cautiously, avoiding formal areas of the garden where weeds would be a serious problem. Street leaves may be contaminated with litter and rubbish, so make sure to sort through the leaves before adding them to your leafmould pile. If your leafmould pile is slow to break down into leafmould, try turning it regularly to aerate the leaves and speed up the breakdown process. Make sure that the leaves do not dry out, moistening the pile if necessary in hot, dry weather.